It is generally assumed that anthropologists do their research in remote and uncomfortable parts of the world--places with monsoons, mud huts, and malaria. In this volume, social anthropologist Kate Fox has taken on an altogether more enjoyable assignment, the study of the arcane world of British horseracing. For Fox, field research meant wandering around racetracks in a pink hat and high heels (standard tribal costume) rather than braving killer insects and primitive sanitation. Instead of an amorphous racing crowd, the author finds a complete subculture with its own distinctive customs, rituals, language and etiquette. Among the spectators, she identifies Horseys, Addicts, Anoraks, Pair-Bonders, Day-Outers, Suits, and Be-Seens--all united by remarkable friendliness and courtesy. Among the racing professionals, the tribal structure includes Warriors (jockeys), Shamans (trainers), Scribes (journalists), Elders (officials and stewards) and Sin-Eaters (bookies). Fox includes witty and incisive descriptions of the many strange ceremonies and rituals observed by racegoers--the Circuit Ritual, Ritual Conversations ("What do you fancy in the next?") , Celebration Rituals, the Catwalk Ritual, and Post-Mortem Rituals (naturally, a horse never loses a race because it's too slow)--and their special codes of behavior such as the Modesty Rule, the Collective Amnesia Rule, and the Code of Chivalry. 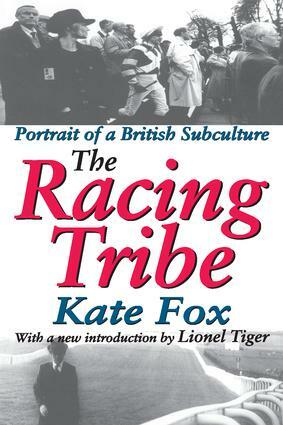 The Racing Tribe is also a refreshingly candid account of anthropological fieldwork, including all the embarrassing mistakes, hiccups, short-cuts and guesswork that most social scientists keep very quiet about.